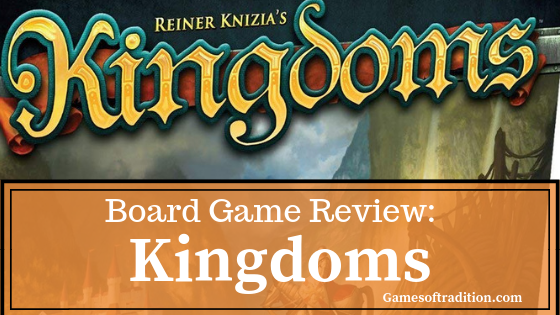 Kingdoms review: In a far far away land, knights fight and build castles. Their lands will be the best. Only the brightest may plan ahead and ensure of the value of their land: for wolves, trolls or dragons may scare the villagers away, our knights will build their most beautiful castles where they see villages prosper. In a turn by turn tile placement game, up to four opponents will seek to build the best kingdom. Let’s see what Dr. Knizia offered in this box. 23 tiles with different actions. To start the game, every player picks a set of castles in the color he prefers. Depending on the number of players, you will have more or less castles with 1 tower. If playing 2 players, each receive 4, if playing 3 player, take 3 and 4 take only two. This will help balancing the board during the game. Next, set the age marker on the first one on the board. An age will end once the board is fully filled. You will play three ages in a game. Take all the tiles, shuffle them face down. Every player picks one they secretly look at, and place face down in front of them. Take your secret tile and play it on the board. Once you have played, the next player may start his turn. You will continue until the board has been filled, at which point you will count your score. And move to the next age, until you have played 3 ages. The player with the highest score then wins. Easy, is it not? 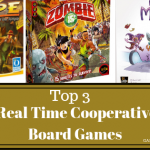 Now, we need to understand a few more things to play correctly: the board is split in 30 areas – 5 rows of 6 columns. Every castle you play will help you score on the row and column you play. Say you play a castle with 1 tower, you will add the value of all the tiles on its row and column. This means that it may score up to 9 tiles values. This is the basic of scoring. But it goes a bit beyond that: when scoring, you will count how many towers you have on each row. Then you will sum the score of the tiles. Multiply the number of towers per the score of the tiles. You now know how much you score for that row. Repeat for every row. And every column. You now know how much you have scored this age. At the end of every age, players discard castles with more than one tower that they have played and retrieve the ones with one tower. Now you know you will want to play your castles in the correct place. 1 dragon which kills any positivism – only score the negative points on the row and column where he landed. Your secret tile gives a level of uncertainty to your game: is your opponent holding to it because it is a strong one, or because he waits for you to play your castle with 4 towers? Should you do it now? Final scoring for the first age: Green: 22 – Red: 29. The red is in the lead, but at what cost? Kingdoms is simple in the essence: play one round to get the rules. Play again to learn to play. Keep playing and you’ll love it. Its mechanic is very fluid and very quickly you will learn to fear your opponents: a good strategy is dictated by maths. Count the tiles, observe your opponent pool of castles. Is he holding on to his strong castles? Then he may have a +6 as a secret tile. Where will he play it? Should you play your own -4 already? And suddenly, a wild dragon appears – nullifying your efforts. You should have known it was coming? But hey: you can place a mountain between this wild creature and your castle, suddenly recovering from this bad situation. A tough moment is always scoring: you may get a good feel of what is the situation, but scoring itself keeps being messy. But this is the pleasure of the game: these maths are the reason to bring the game on the table and if a bit of multiplication and addition is not to your taste, this game may not be for you. 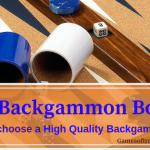 Once again, Reiner Knizia used his passion for maths to build a simple and yet addictive board game. Every game takes 30 to 40 minutes, but you will find yourself playing for more. OK, scoring is always messy: my friends and I love the game, but as it goes, quite often we are stuck in recounts. So I came up with a helpful tool: you can download a small Android Application which will help you keep track of your scoring. It is only available on Games of Tradition! Click here to get it! Have great time playing Kingdoms!